If you’ve been exposed to asbestos on the job and later develop mesothelioma, you may be eligible for a workers’ compensation claim. Workers’ compensation is an insurance employers have in case of employee injury. Filing requirements vary by state, so it’s vital to seek a lawyer familiar with local laws. The statute of limitations to file a claim also varies by state. Each state sets their own maximum compensation payouts for these claims. Asbestos is known as a leading cause of occupational cancer in the United States, with millions of people exposed on the job globally each year. While asbestos remains in countless old buildings and schools and the toxin is still legal to use in certain industries, millions more will continue to be exposed and face mesothelioma or other asbestos-related diseases. 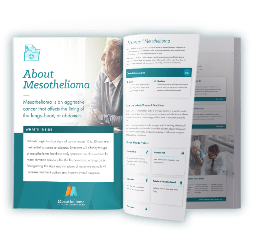 Workers’ compensation is one type of claim and remuneration that mesothelioma victims may be eligible for if they were exposed to asbestos through their occupation. Workers’ compensation is a type of insurance employers have through a state-mandated program to allow employees injured on the job to receive financial help. All states have some form of the program, but some states may allow exemptions for small businesses with only a handful of employees. There is also a federal workers’ compensation program for government employees who are injured through their duties. The injuries and illnesses covered under workers’ compensation laws are broad, and include asbestos-related illnesses. A claim can provide financial assistance help recover lost wages, cover medical care expenses and pay for other related needs. In some instances, claimants may also get assistance in training and finding another job. It’s important to note, it’s not in the nature of these claims to place blame. As such, employers are essentially clear of any liability and employees give up the right to sue an employer. This means a mesothelioma victim loses the right to sue an employer for the pain and suffering that accompanies a mesothelioma diagnosis. Further, a workers’ compensation claim does not take pain and suffering into consideration when the monetary award is being determined. However, even for those who file workers’ compensation, they could still potentially file a mesothelioma lawsuit against the asbestos manufacturer responsible for their exposure, rather than a lawsuit their direct employer. For these circumstances, it’s crucial to seek help from an experienced lawyer and understand your legal rights before taking legal action. Each state has their own workers’ compensation program, so the exact processes in place may differ depending on where you live. There are, however, rather universal eligibility requirements before filing a claim. It will be important to work with an experienced mesothelioma lawyer to ensure that you fit your state’s eligibility requirements and get the appropriate legal advice regarding your asbestos injury to have a successful claim. Once the claim is filed, the governing board of the workers’ compensation division in the state will review and determine the claimant’s eligibility for workers’ compensation benefits. They will go over the evidence submitted in the claim, and decide the appropriate amount of compensation based on the injury. The amount of compensation received will also keep in mind the workers’ salary and medical bills resulting from their injuries. Some states, like Missouri, even have provisions specific to asbestos claims to help workers more easily get the compensation they deserve. States generally have their own determined maximum amount of compensation any claimant can receive, which can be paid out in either monthly installments or as one lump sum. The efficiency and payment of these claims can become tricky, depending on who insures the employer. Depending on the state and size of the company, employers can become insured through a private insurance company or through a state fund. Montana, for example, had an old state fund that has still left hundreds of open claims and used to have an unfunded liability of over $500 million. While the state is working to fix the issue and has other insurance options now, many claimants still face a long wait time. Working with an asbestos lawyer can ensure that your claim is handled appropriately and in a timely manner. The exact filing process will also differ from state to state, including the statute of limitations in which a mesothelioma victim can file. An experienced mesothelioma lawyer can explain the unique process for your state, taking state laws and time constraints into account, and ensure workers’ compensation is the best option for your individual case. The worker’s compensation programs for federal employees work rather similarly to the regular state programs, though there are some additional requirements involved when making a claim. The U.S. Department of Labor’s Office of Workers’ Compensation Programs (OWCP) administers four main programs for employees or surviving family members to receive benefits because of a workplace injury or illness. Though all federal employees are covered, the OWCP also has several specialty programs for specific groups of employees, like longshoremen and harbor workers. Like the state-regulated workers’ compensation system, federal workers’ compensation allows for wage replacement and medical benefits, and may also provide training for a new job position depending on the circumstances. Even if your asbestos exposure and resulting mesothelioma is work-related, it’s important to note workers’ compensation is just one type of claim you may be eligible for. Many law firms can provide a free consultation to discuss all of your legal options and decide what type of claim would be the best fit for your individual case. 1 Missouri Department of Labor and Industrial Relations. Changes to the Missouri Workers' Compensation Law. 2 United States Department of Labor. Basic Information on New Claims. 3 United States Department of Labor. Division of Federal Employees' Compensation.